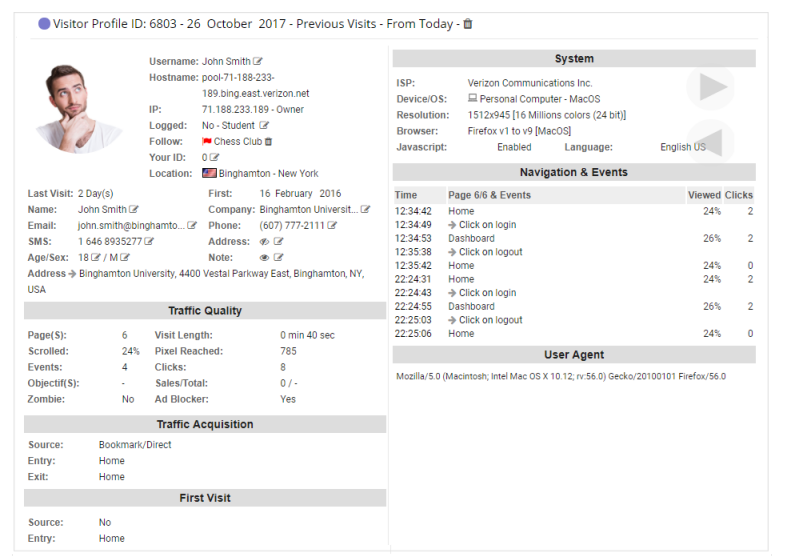 This widget shows the list of the last visitors. To see the entire listing, you have to select the "Last visitors" or "All visitors" option in the Visitors menu or click the full screen button on the toolbar. Note: Search options and custom date range filter are available in full screen report. Flag of the visitor country. Hostname or IP address of the visitor. Search engine term and rank. Entry, exit or current page viewed. Number of events triggered 1. Visitor purchased an item on the website $ . Returning or new visitors. If returning, their last visit in number of days. Move your mouse pointer over the flag to know the visitor city, state, and country. Move your mouse pointer over the Hostname to know the IP and the company name or ISP. Move your mouse pointer on the event round 1 to display the last event. Move your mouse pointer on the campaign round 1 to display its name. By clicking on the hostname, all information about the IP address owner will be displayed in a new window. By clicking on [who], all information about the referrer will be displayed in a new window. Silver and Gold plans give you access to additional data. If the user is logged, the icon is displayed. The user name or displayed name is displayed. If the user is included in a list, the icon is displayed. If the user reached a goal , the icon is displayed. By clicking icon , you can call the user. By clicking icon, you can send a SMS to the user. By clicking on the User Name, you can send it an email. View the visitor's detailed profile. By clicking on the page views 1 , or event 1 round, you will get the entire profile of the visitor. Note: Several features requires Silver or Gold subscriptions. The advanced data are sent by analytics.js or by the AFS WordPress Plugin. 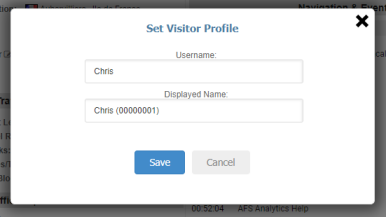 For more information, please read "How to send visitor data to AFS analytics". You can modify or define the user's information such as his name, his company, his address, his phone number, his email, etc. by clicking on the icon next to the field. The field Role allows you define the visitor role: member, administrator, etc. 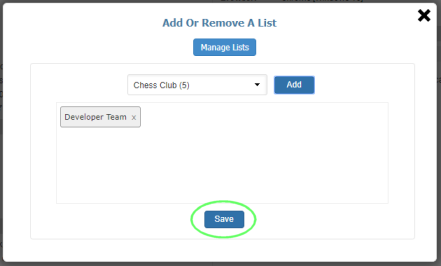 Create lists to group visitors. Visitors can be placed in lists or categories to observe their behavior by group and/or receive notifications. For example, if you want to follow all the people who buy something on your site, you can group them in a list called buyer. Click on icon. A new dialog box is displayed. 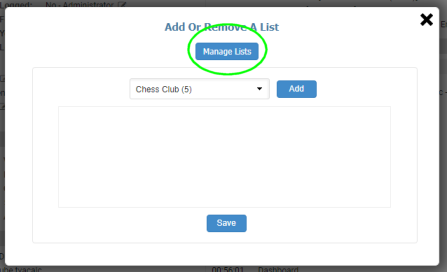 Click Manage lists. 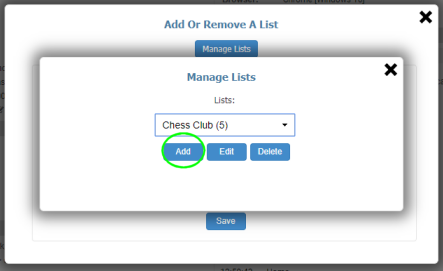 A new dialog box is displayed which shows the lists recorded. Click Add to create a new list. 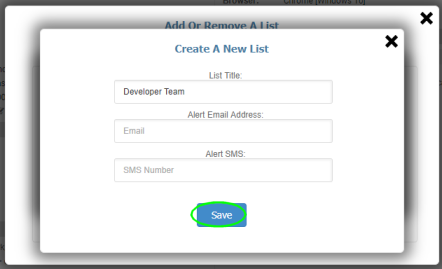 The Create list dialog box is displayed. Choose the name or title of the list. If you want to receive an email notification each time a member of this list visits the website, type your email address. If you want to receive a SMS notification each time a member of this list visits the website, type your SMS number. On the visitor profile, click icon. A dialog box displays the lists recorded. Choose a list and click Add. Click Save. The visitor will be added to the list. By clicking on the IP address or the hostname in the widget, all information about the IP address owner will be displayed in a new window.